First of all: The task will fail. Why? In his blog post Under the covers with Storage vMotion Kyle Gleed outlines in six steps how the Storage vMotion process works. (1) It starts by copying the configuration files to the destination datastore, (2) then creates a "shadow" VM with these files. (3) This VM waits in idle mode until the hard disk is copied to the destination datastore. (4) The copy process works iteratively using CBT (Changed Block Tracking) until there is only a small enough amount of changed blocks left to transfer. This works all fine in our "self-referential" case. But then there is a step that involves a so-called FSR (Fast Suspend and Resume) operation: It will stop the original VM, copy the remaining dirty blocks and then start the shadow VM so that it can take the place of the original VM. This FSR operation will normally take an unnoticeably short time, but in our case it can never complete, because - as soon as the original VM is suspended - the datastore that it provides and the shadow VM that sits on it become inaccessible. That means the remaining blocks (if any) can not be copied and the shadow VM can never be started. 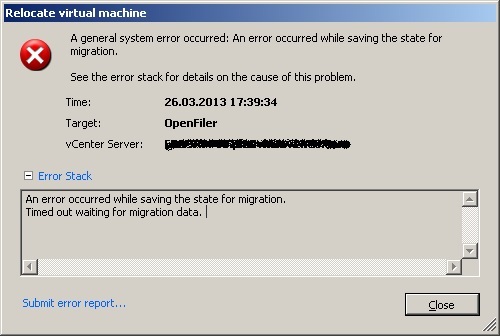 After a certain timeout the task will be declared a failure, and the original VM will be reactivated. (2) Some readers believed that vCenter would even prevent this task from starting, foreseeing that it can never complete. This software is smart, but not that smart. Bjoern Roth: "While Fast Suspend and Resume is invoked the remaining dirty blocks can not be copied successfully." @jpiscaer: "Because there's a cut-over point when the VM is pauzed and the home location of the VM is switched over to the new location; by which point the shared datastore goes offline and the VM that was just moved is disconnected"
According to the answers to the second question (Have you tried this yourself before answering the first question?) very few readers actually tried this themselves, but none of them picked the right answer!? Most of them picked (4) which probably means that they ran into another storage related issue when testing. So, that was it. I hope you had fun!